An Xbox One Insider shared on Reddit their find in the latest announcements. According to the provided images, Microsoft is introducing a self-service refund feature. For many gamers, this is a blessing. Oftentimes, particularly in an age when we have games in early access and preview programs, we find ourselves dissatisfied with a game but are saddled with the purchase. With this Self-Service Refund feature, no longer will the buyer have to beware. At least, that is, when it comes to Xbox One and Windows 10 games/apps. You’ve spoken; we’ve listened. In support of offering gamers the freedom of choice, we’re making changes to the Microsoft Store purchase experience by offering customers a simple way to instantly return digital products like games and apps through account.microsoft.com. When a game or app leaves you wanting more, we’re here to help. 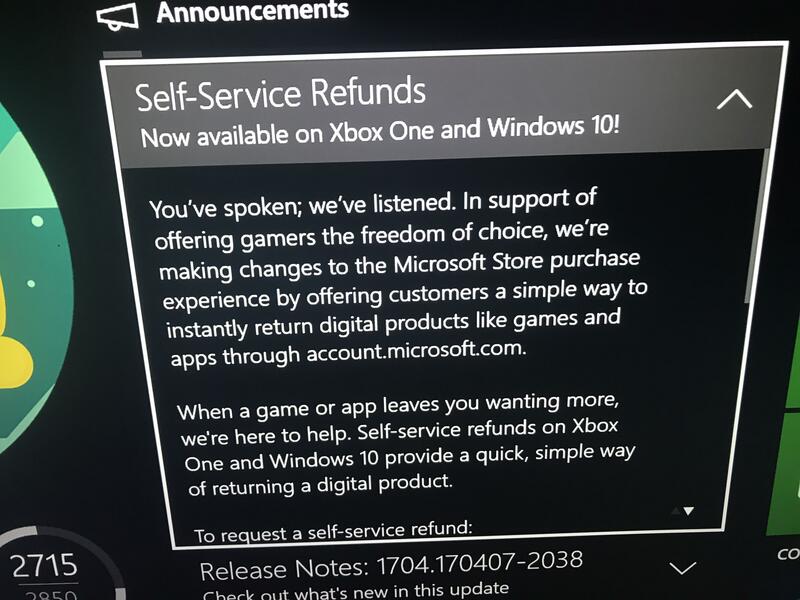 Self-service refunds on Xbox One and Windows 10 provide a quick, simple way of returning a digital product. Navigate to account.microsoft.com and sign-in. From the top menu bar, select Payment & billing > Order history. Navigate to a purchased game or app, and select Request a refund. Games and apps are eligible for self-service refunds within 14 days of purchase if you have less than 2 hours of play time across all accounts. DLC, season passes, and add-ons are not eligible for self-service refunds. The game or app must be downloaded and launched before requesting a self-service refund. You must wait for at least 1 day after the game or app’s release before requesting a self-service refund. Certain Windows 10 apps may not be eligible for self-service refunds. Microsoft reserves the right to block access for users who abuse self-service refunds. This service is similar to other digital markets such as Steam and Sony’s PlayStation Store. Both of which have 14-day refund policies, except in Sony’s case, it is only allowed if the game hasn’t been downloaded yet. Microsoft looks to be taking a smarter ‘Try it before you buy it’ approach with restrictions excluding DLC, season passes, add-ons, in-game purchases, and select titles that haven’t been specified. Would you use the self refund feature?